Here is "The Short Bus" entry, in honor of my daughter and Rob Riley's son. Both born with life long disabilities. This ain't YOUR daddy's Short Bus! This is my first attempt at doing anything other than following the instructions to the "T". I'm not a gear head and know nothing about the technical part of a car, engine, chassis and body (as some will note). I just love this look -- BIG tires and raked! 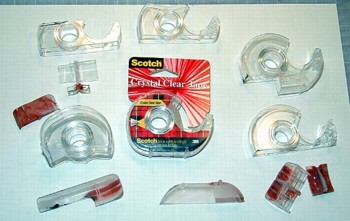 The idea came from using a Scotch tape dispenser one day. It makes the perfect C-Cab! The entire main body cowl and fenders (front and back) are made from pieces and parts from 6 tape dispensers (pictured in photo 2). There was also a spray can lid cut and fitted to make the wall between the driver and the back of the bus. The interior, engine, gages, fire wall and chassis came from a 1/20th scale MPC 1971 Corvette Sting Ray kit. Highly modified to fit the bus. The nose piece is the end of my deodorant cap cut and shaped to fit the front. The front end of the chassis, rear end, and some parts here and there are from a Lindberg, Motorized Silver Streak 1990 GT Sport Coupe. The other parts came from partial kits of new and old. Tires and wheels donated from Mr. W. Jones, of Huntley IL. Thanks. I wish I had this Short Bus as my ride to S'Cool.